Fishing license sales grew beyond their previous 10-year high, set in 2010. The Recreational Boating and Fishing Foundation announced that participation in fishing increased for the second consecutive year in 2017, with first-time participation growing more than 20 percent. Numbers from the Outdoor Foundation’s Outdoor Recreation Participation Report and the U.S. 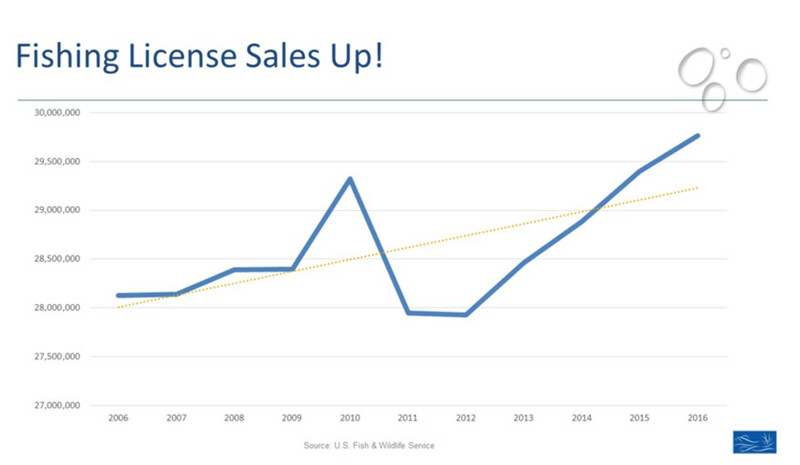 Fish & Wildlife Service’s Historical Fishing License Sales Data both show growth in fishing participation. Participation rose 4 percent, to 49.1 million, in 2017, and fishing license sales increased 1.3 percent, a 4.3 percent increase over the last decade. Three million people fished for the first time in 2017, up 21 percent from 2.5 million in 2016. Hispanic participation grew in double digits, with 4.2 million fishing in 2017, an 11 percent increase over 2016. Participation among people ages 6 to 17 was up 5.4 percent, to 11.6 million, and female participation increased 3.1 percent, to 17.1 million. Set for release in the coming days, the Outdoor Foundation report highlights participation and trends across the entirety of outdoor recreation, including fishing, hiking and biking, among others. The 2018 Special Report on Fishing, to be released in July, includes additional information on participation by gender, age, ethnicity, income, education and geographic region. The Fish and Wildlife Service also issues an update on license sales each year, including tags, permits and stamps, as well as the gross cost of fishing licenses sold.